Alphabets A-M are numbered 0-9 expect for the vowels. Alphabets N-Z are numbered 0-9 expect for the vowels, (After 9, start the numbering from 0 again). The codes are written from left end to right end. If two or more condition is applicable then take all the conditions into consideration. Condition 1: If the word begins and ends with constants, then both the consonants are coded as the code for the alphabet which comes next at a gap of 1 from the given alphabet. (E.g. The code for “H” will be coded for the code of “F” and so on), this condition is not valid for single letter word. Condition 2: If the word begins and ends with Vowels, then both the Vowels are coded as the code for the alphabet which comes before at a gap of 1 from the given alphabet. (E.g. “G” will be coded as the code for “I” and so on), this condition is not valid for single letter word. If condition 2 and 4 both are applicable, then give priority to condition 4. 1. What is the code for the word “Wealth”? Wealth – Condition 1 applies. 2. What is the code for the word “Dissent”? Dissent – Condition 1 and 4 applies. 3. What is the code of the Sentence “advice from Senior”? 4. What is the sum of all the digits of code of the word “Impulsive Administration”? 5. Which of the following will be coded as“#0099#”? P, Q, R and S are the corners of a rectangular field such that P is to the North of Q. R is 0.5km to the East of P. The longer side of the rectangular field is 2.4km. I, J, K and L are the corners of an another rectangular field Such that I is 1900m to the west of K. L is 600m to the south of K and in the East of J.
Rectangle IJKL intersects line joining PQ and RS at AB and CD respectively. It is also known that A is 0.7km towards East of I and D is 0.9km towards North of S.
Abi walk from point I towards east direction and After walking 700m he takes left turn and walk 1500m to reach his school. Then he takes right turn and walk 0.9km to reach his house. Finally he moves 0.6km towards south to reach his garden. Sai Stands at point C. He moves 0.35km towards east direction and he takes right turn and walk 1km to reach his Hospital. If Amir wants to reach the point I from Point S, then which of the following will be the correct direction to reach his destination? 7. 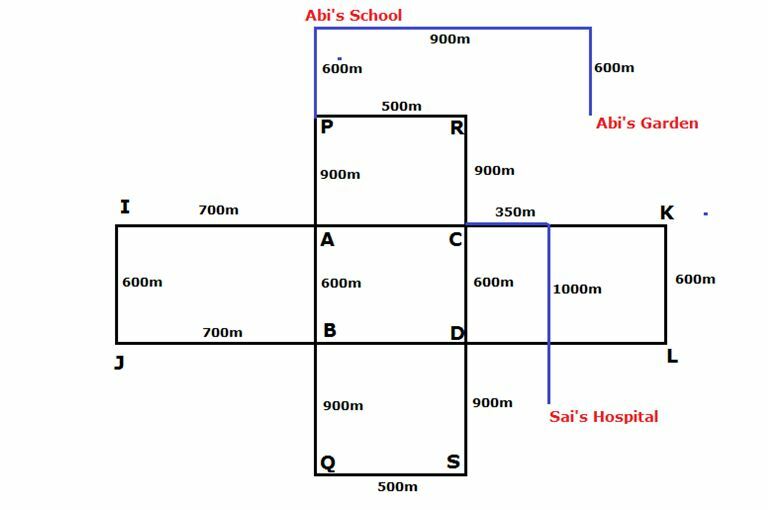 What is the position of Abi garden with respect to Sai’s initial point? Which of the following statement(s) is/are not true? I) Abi’s school is in northwest direction with respect to Sai’s hospital. III) Sai walks 350m from his hospital towards east, and then he takes left turn and walks 0.7km to reach a point which is middle of the point C and D.
9. If Suji’s house is 0.9km to the north of point I, then how far and in which direction Suji’s house with respect to Abi’s garden? Suji’s house is 1.6km west with respect to Abi’s garden. 10. What will be the minimum possible distance to reach point J from Sai’s hospital (Distance is covered either horizontally or vertically)? So Either option A or option C will be minimum possible distance to cover the distance. 1) What is the code for the word “Wealth”? 2) What is the code for the word “Dissent”? 3) What is the code of the Sentence “advice from Senior”? 4) What is the sum of all the digits of code of the word “Impulsive Administration”? 5) Which of the following will be coded as“#0099#”? 6) If Amir wants to reach the point I from Point S, then which of the following will be the correct direction to reach his destination? b) Amir walks 1.5km to the north of point S, then he take right turn and walks 700m and then he take right turn and walk 600m and then he take right turn and walk 1.9km to reach point I.
d) Amir walks 600m to the north from point S and then he takes left turn and walk 500m and then he take right turn and walk 1.8km to reach point I.
e) Amir walks 500m west from point S and then he takes right turn and walks 0.9km then he take left turn and walk 0.7km and finally he take right turn and walks 600m to reach point I. 7) What is the position of Abi garden with respect to Sai’s initial point? 8) Which of the following statement(s) is/are not true? 9) If Suji’s house is 0.9km to the north of point I, then how far and in which direction Suji’s house with respect to Abi’s garden? 10) What will be the minimum possible distance to reach point J from Sai’s hospital (Distance is covered either horizontally or vertically)?